We trudge the downtown route most Saturday mornings in a desperate effort to match weight and fitness so we've watched and dodged as the street-siders and carts come and go. Every small opening is a symphony of barber shops and phone vendors, mom and pop stores or eateries and business card printers, wedding packagers, beauticians and motor bike repair shops. ​The next street may be filled with on-the-street light industry rebuilding air cons and TVs or making doors in steel or wood with fireworks of sparks illuminating the back of dark storage spaces. Sandwiched in may be a sculptor doing unique, austere Buddhas or a painter of Chinese fish. Happy. Loud and colorful. Better than a Rock Show and it's all for free. Navigating Phnom Penh Street is a sport. The sidewalks are full of things for sale. And often we are the only barangs (foreigners) doing the trudge but always with big smiles aimed at us and even waves from those that recognize our doughy forms from earlier weeks. We navigate through all the hustle and bustle of these streets ducking around the transports and escaping onto the road when the streets overflow. Sometimes, we have to turn back because we just can't get through and it can test your patience when the sun gets too hot, but a quick duck into an aircon show room and, in a minute or two, the good temper returns. 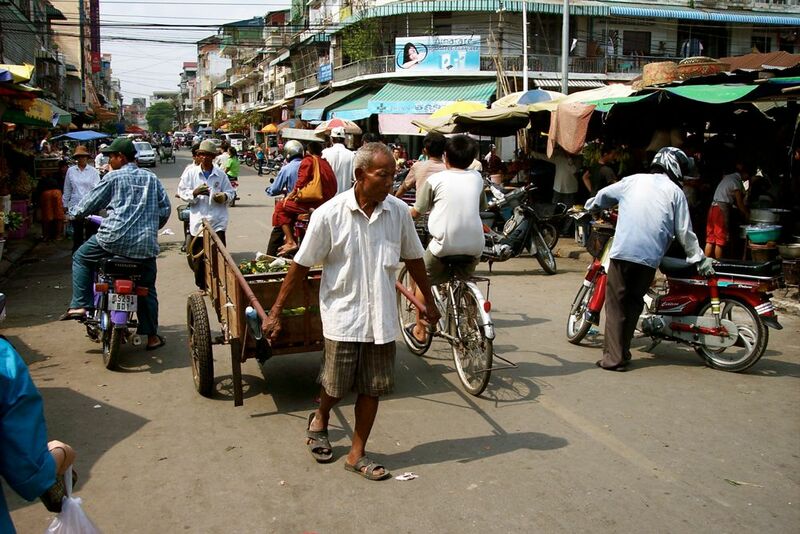 These streets are a tumble of parked cars, vans, motos, tuk tuks, motorbikes, bicycle rickshaws and hand carts. Every corner is a restaurant, coffee shop or bakery with tables of noodles and mystery meats just waiting. And to top it off are the peddlers or street hawkers with the last bag of sun glasses or toys they were able to slip in from China, Vietnam or Thailand. And then the grandmas with their instant cooking of noodles and fresh greens packables and brought to the shop door. 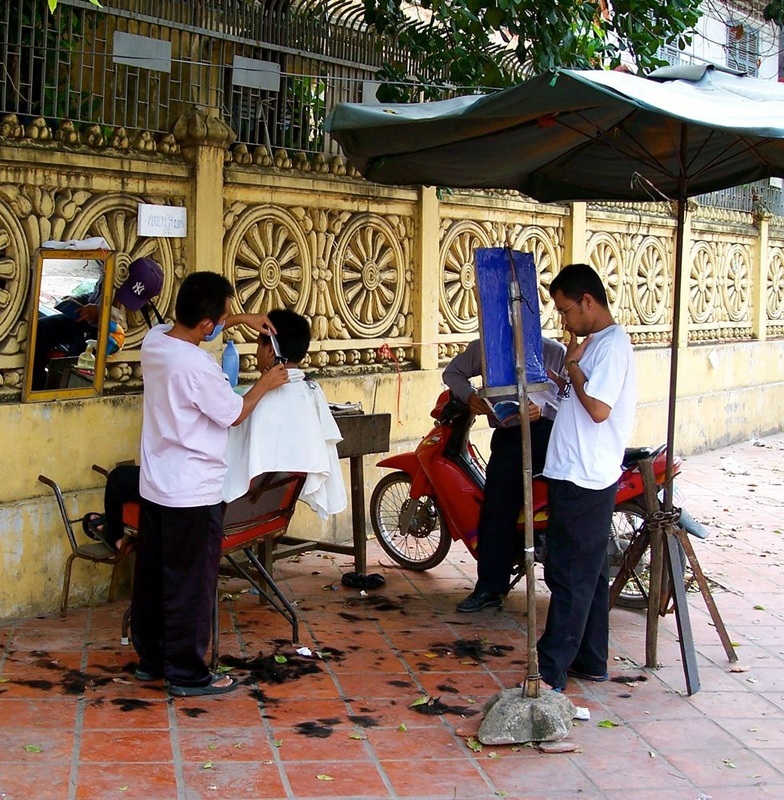 When we first worked in Phnom Penh around 2002, Phnom Penh streets and houses were hardly identified. Since 2011, Phnom Penh's street and house identification has been improved. Residents of Phnom Penh can get new numbers for their house upon payment of $4. Some people still contested this as too expensive. But without proper street names and house numbers, it is difficult to deliver services in the city. Many houses and even streets have as yet to get their signs. It is easy to get lost even when you have the map as the signs are not properly placed. Hopefully, 2014 will bring in the new signs but better still to work with your tuk-tuk driver. On many occasions, they say yes or nod but they really don't know. So, you're on your own. Am back in Phnom Penh this 2016 and what really surprised me is the proliferation of coffee shops. There's one in every corner and many will satisfy even the coffee snobs. Here's a great review of these coffee shops. Street Vendor in Phnom Penh. Copyright: aesta1. Get here in Phnom Penh quickly. This won't last. This hints of Paris and London of the 18th century when cities were not sterility zones. This is the Singapore and Hong Kong of late Kipling and early Michener and middle Conrad and Greene-noire. You can walk in history and celebrate the chaos of life. 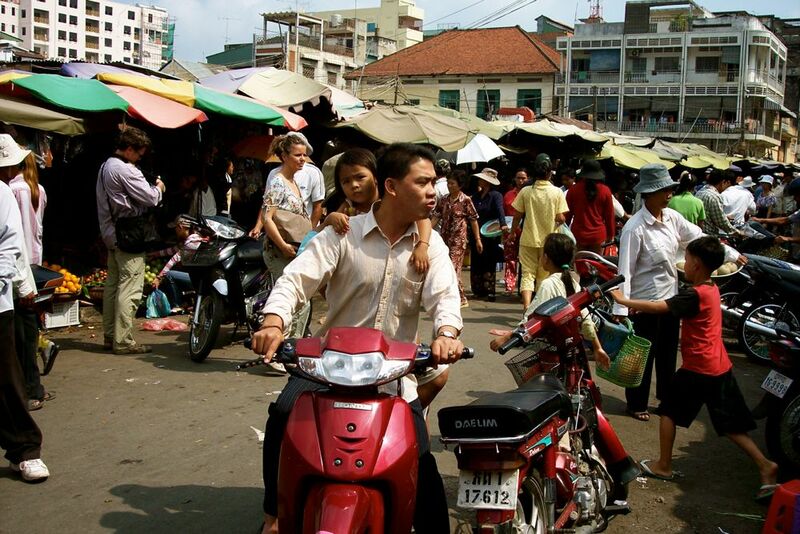 Did you enjoy your visit to the streets in Phnom Penh? Before you leave, do share your thoughts below.